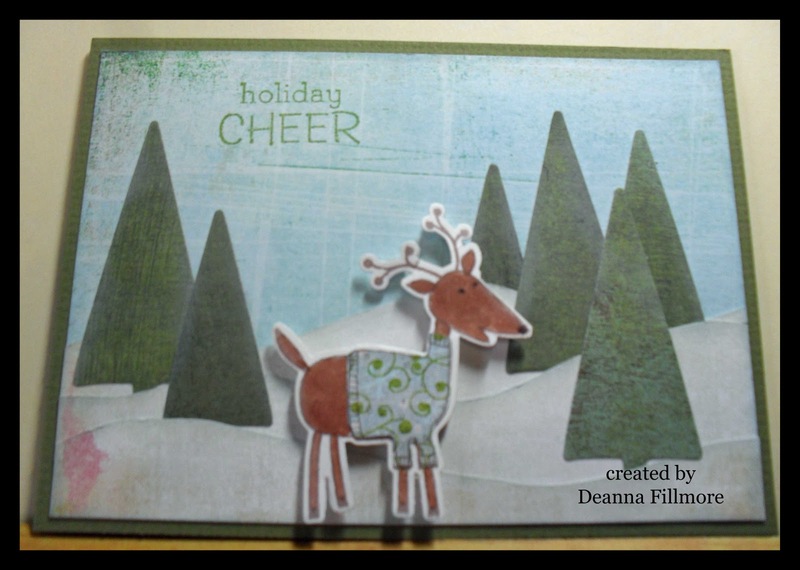 L'il Dee's Crafting with a Kitten: Holiday Cheer! 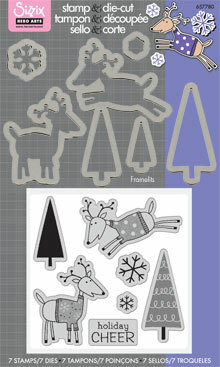 I couldn't resist this Holiday Cheer stamp & die set (sizzix & hero arts) that came in last week at Scrap Arts. It is just too cute!!! I think I want the Snowman Joy set as well. I love that these dies have the cut edge on the very inside edge so that you know exactly where you are cutting. I'm not sure what to do about that white edge you get around your image. Leave it white or colour it in. Well for now I decided to leave it white. Here is my first card I made using the set and I used 4 different patterned papers as well. They are all from basic grey, the trees are from figgy pudding line, the snow is from the bittersweet line and the blue background and sweater are from the eskimo kisses line. I thought it would be fun to paper piece the sweater to help tie it all together. I stamped the reindeer with memento rich cocoa ink and coloured him with a copic marker E25. I edge the trees with versa magic cloud white and the snow with versa magic aspen mist. I stamped the greeting with peeled paint distress ink and popped the reindeer up with 3d dots. Also I totally forgot to put my November schedule up so I am going to do that now. I'll even try and put December's schedule up too if I get the chance. I will be back in a couple of days with another project to add for my challenge and maybe a couple of other things as well. Thanks for stopping by and have a great week. Also on Friday don't forget to take the time to honour all the wonderful men & women of the armed forces who are no longer with us.